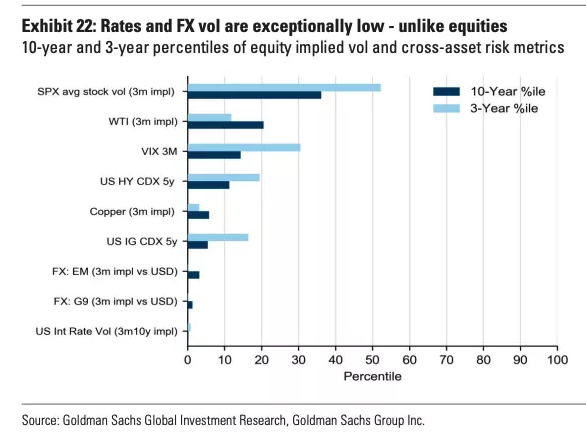 Cross-asset volatility has collapsed in 2019 amid the rally. Liquidity (defined as market depth) has seemingly stopped improving, however. Any "professional" bull thesis from here generally involves a tale of under-exposed investor cohorts being "forced in". That's plausible, but to employ a horrid cliché, "the risks are myriad". 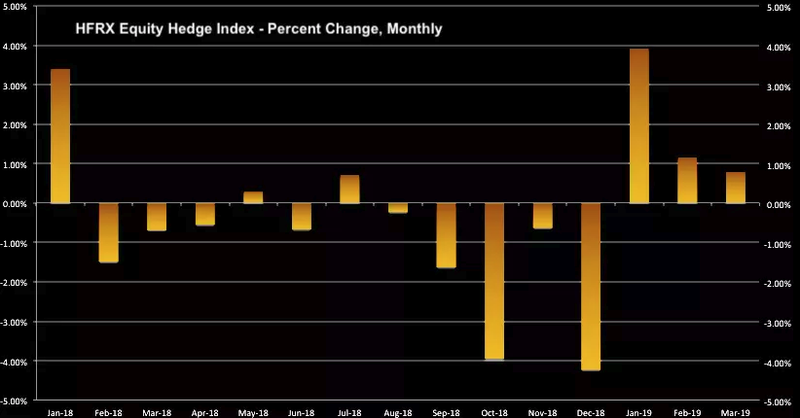 It turns out that despite the ongoing collapse in cross-asset volatility that's naturally accompanied 2019's "everything rally", liquidity has stopped improving. "Liquidity" is a somewhat amorphous concept that most investors still struggle to get their heads around. That's understandable, as it can mean different things in different contexts. Despite what you may have heard, there is no single, unifying definition of "liquidity". For our purposes here, I'm talking about market depth, which became extremely impaired following the February 2018 VIX event and only managed to stage a meager, half-hearted recovery before disappearing again during Q4's cross-asset malaise. 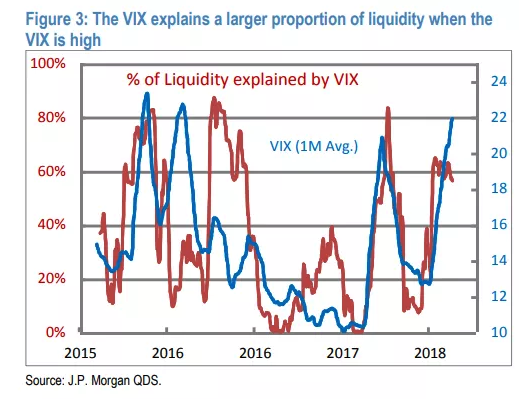 The chart above is from a Goldman piece out Tuesday and, colloquially speaking, what you want to note is that 2019's bounce in the dark blue line has fizzled, and in any case, only managed to bring about a modest improvement in liquidity conditions. That's somewhat disconcerting, although I've learned over the past two years that using words like "disconcerting" when writing for an audience that's generally predisposed to bullishness is something of a faux pas. It's obviously not a coincidence that market depth disappeared in and around 2018's selloffs. In fact, market depth and volatility are inextricably bound up with one another, and that relationship has become stronger over time. Back in January, JPMorgan's Marko Kolanovic (still the recognized authority on these matters) noted that when you throw systematic flows into the mix, you end up with a "feedback loop" that has the potential to become particularly pernicious during times of acute market stress. Incidentally, a couple of recent articles in the mainstream financial media have used Marko's "feedback loop" in headlines (e.g., this one from Bloomberg). But the original exposition in the context of Q4's volatility was contained in a January 16 note, which I profiled extensively at the time. 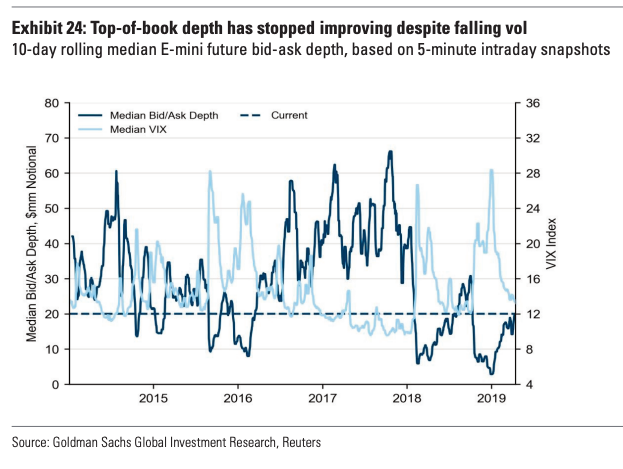 As Marko wrote three months ago, the relationship between market depth and volatility "is very strong and nonlinear - market depth declines exponentially with the VIX." Of course, rising volatility has the potential to trigger systematic selling (e.g., de-leveraging from trend-following strategies and the vol.-targeting crowd). Those flows then drive up volatility further. The concurrent lack of market depth exaggerates price swings. Those are the mechanics of the "loop". Figure 3 shows the % of liquidity variation that can be explained with the VIX over time (rolling R-squared). The higher the VIX, the more liquidity is driven by the VIX, and recently up to ~80% of liquidity variations were explained by the VIX. This isn't just a one-way phenomenon, though. As we saw on December 26, 27 and 28, when large rebalancing flows hit a thin market after Christmas, buying when market depth is impaired can exacerbate the action on the way up as well. I penned a super-fun explainer on that called "How Boris, Mike and Zachary Seized The Market Narrative" late last year, but suffice to say that had it not been for that rebalancing flow, December would have been even worse. Getting back to the first chart shown above, it's somewhat surprising (and again, I've learned to use "surprise" as a euphemism for "disconcerting" depending on the target audience) that liquidity appears to have stopped improving despite what, on some measures, is the largest collapse in cross-asset volatility since at least 2014 and maybe since Mario Draghi's "whatever it takes" moment in 2012. The most important driver is likely the increase of volatility (e.g. VIX), given that many market making algos (as well as business models) were calibrated during the years of low volatility. As these programs don’t have an obligation to make markets and are optimized for profits, they likely adjust quotes and reduce size in order to maximize their own Sharpe ratio. Again, things should theoretically improve as volatility falls, but as you might have heard, 2019's rally has been variously maligned as "flow-less". Equity fund flows have been generally M.I.A., and key investor cohorts' beta to equities suggests under-exposure is rampant. Long/Short hedge funds' beta to the S&P (SPY), for instance, is sitting somewhere around the 12th percentile going back to 2003. And Nomura's model puts risk parity's allocation to US stocks at a two-year low. Indeed, the notion that this has been "a rally nobody owns" (so to speak) is a key pillar of the bull thesis going forward. The idea is that if volatility continues to decline (or stays anchored), systematic investors will mechanically re-leverage/re-risk, while the ubiquitous "fear of missing out" will "force" the fundamental/discretionary crowd to join the party. It's helped that we've been on the "right" (i.e., long) side of the dealer gamma equation recently, which has served to "pin" stocks and tamp down volatility. On that point about under-exposed hedge funds, note that despite having a good three-month run, equity funds have still massively underperformed the S&P. As anyone who's familiar with my posts or frequents my site is acutely aware, there's a lot more to it than the above, but suffice to say that any bull case emanating from professionals generally incorporates some elements of the above argument about key groups who have missed the action getting pulled in one way or another (i.e., mechanically in the case of systematic strategies, or by the vaunted "FOMO" tractor beam in the case of the fundamental/ discretionary universe). Bringing this all together, what you want to keep in mind is that if what we've seen in 2019 has simply been the result of, for instance, short-covering and buybacks into a thin market (as noted above, thin markets can accelerate things on the way up, just like they can on the way down), then stocks can move higher on continued re-leveraging. Kolanovic outlined that late last month. At the same time, the Fed and its global counterparts are now back in the volatility-suppression businesses. Aggressively dovish forward guidance is likely to work its magic in that regard, underwriting "carry mania" (to quote a recent note from Nomura's Charlie McElligott). Still, concerns remain, not the least of which is the fact that nobody yet knows whether recent "green shoots" (e.g., upbeat PMIs out of China, better-than-expected export and credit growth figures from Beijing, a solid March jobs report and ISM stateside, a beat Tuesday on German ZEW expectations, etc.) presage an actual, sustainable inflection in the global economy or whether things will take another turn for the worse in the months ahead. Recent downgrades to the outlook from the IMF and the WTO and a still-dour forecast for the German economy underscore the fact that we're nowhere near out of the woods yet. GDP and activity data out of China due later this week will be crucial to the narrative. In the US, earnings are expected to shrink for the first time since 2016 by the time Q1 reporting season is all said and done, and guidance will be watched closely to assess how management teams feel about the macro headwinds, which, depending on where you look, are still "gale-force". With market depth still lacking and with many investors inclined to doubt the rally (if only out of sheer spite after having missed it), things remain somewhat fragile. On the bright side, longer-dated hedges are now extremely cheap.